Have you seen Dr Ola's blog? It's full of the most amazing recipes, including German biscuits and wonderful Egyptian traditional foods! 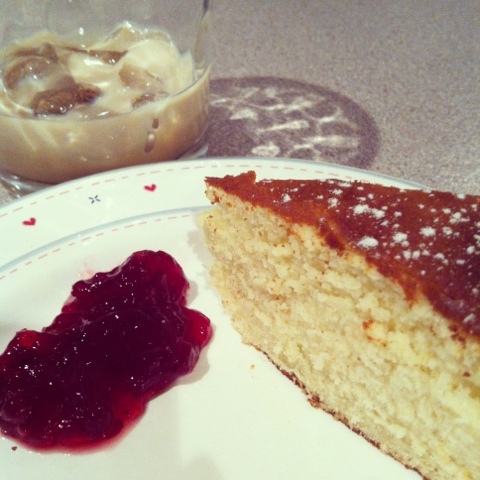 I found this recipe for a condensed milk cake and decided to try it this afternoon. It was so delicious and super quick and easy to make. Dr Ola is one clever lady! 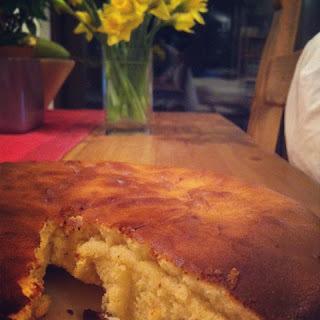 All you need is 4 eggs, 150g plain flour, 400g condensed milk, 1/2tsp baking powder and 50g melted butter. You whisk them all together with an electric mixer until smooth, before pouring into a round cake tin and baking at 175c for up to 40 minutes. (mine only took 25 minutes) Easy peasy! Once my cake had cooled, I dusted it with icing sugar and served with a dollop of lingonberry jam to add a little touch of Scandinavia! The flavours went perfectly together. I recommend serving the cake just like this, with a little glass of Bailey's or a cup of tea and a cozy episode of Call the Midwife! hi, Nikki! it looks wonderful! i want to try..if i find condensed milk here, hehe. yes, my blog party was great, mainly i found few more blogs to connect with and got few more followers. i guess you also got many new followers, congrats! Ohmigosh that looks so good. My mouth is watering right now. It tastes so good! I was surprised since it doesn't require very many ingredients but it turned out lovely! I am totally checking out that website and putting this cake on my recipes to try list!